Do the Saudis have an oil market strategy beyond pumping crude to defend their market share? Are they indifferent to which countries’ oil industries survive? Or, alternatively, are they targeting specific global competitors and specific national markets? Did they start with a particular strategy in November 2014 when Saudi Petroleum and Mineral Resources Minister Ali al-Naimi announced the new market share policy at the OPEC meeting in Vienna and are they sticking with it, or has their strategy evolved with the evolution of the global markets since? And, of course, what does the Saudi strategy beyond pumping crude portend for the Saudi approach to some OPEC members’ calls for coordinated production cuts within OPEC and with Russia? Conventional wisdom has it that the Saudis are focused primarily on crushing the U.S. shale industry. In this view, the Saudis blame the U.S. for the supply-demand imbalance that began to make itself felt in 2014. U.S. production data seems to support this. Between 2009 and 2014, U.S. crude and NGLs output increased nearly 4 million barrels per day, while Saudi Arabia’s increased only 1.64 million barrels per day, Canada’s 1.06 million, Iraq’s 0.9 million, and Russia’s 0.7 million (Saudi data doesn’t include NGLs). In addition, the Saudis, among many others, believed that U.S. shale would be the most vulnerable to Saudi strategy, given relatively high production costs compared to Saudi production costs and shale’s rapid decline rates and the need therefore repeatedly to reinvest in new wells to maintain output. Yet, if the Saudis were focused on the U.S., their efforts have been unsuccessful, at least in 2015. As the table below shows, U.S. output growth in 2015 outstripped Saudi output growth and the growth of output from other major producers in absolute terms. In addition, many observers also came to believe that U.S. shale production will recover more quickly than production in traditional plays once markets balance due to its unique accelerated production cycle and that this quick recovery will limit price increases when markets balance. Is the U.S. Really the Primary Target? 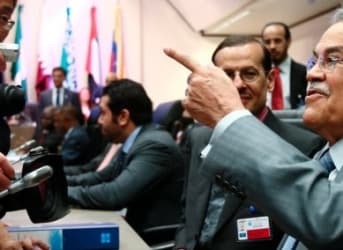 The above considerations imply the Saudis—if indeed they primarily were targeting U.S. shale—embarked on a self-defeating campaign in November 2014 that could at best deliver a Pyrrhic victory and permanent revenues losses in the US$ hundred billions. The Saudis presumably exported the incremental 606,000 barrels per day (460,000 from net increased export capacity plus 146,000 diverted from the U.S.) to their focus markets. Since other countries’ import data generally is less current, complete, and available than U.S. data, where these barrels ended up must be found indirectly, at least partially. The Saudis find themselves in a difficult battle for market share in China, the world’s second largest import market and the country in which the IEA expects absolute import volume will increase the most through 2020—1.5 million barrels per day (it projects Other Asia demand to increase 2.0 million). The Saudis are China’s leading crude supplier. However, their position is under sustained attack from their major—and minor—global export competitors. For example, through the first eleven months of 2015, imports from Saudi Arabia increased only 2.1 percent to 46.08 million metric tons, while imports from Russia increased 28 percent to 37.62 million, Oman 9.1 percent to 28.94 million, Iraq 10.3 percent to 28.82 million, Venezuela 20.7 percent to 14.77 million, Kuwait 42.6 percent to 12.68 million, and Brazil 102.1 percent to 12.07 million. As a result of the competition, the Saudi share of China’s imports has dropped from ~20 percent since 2012 to ~15 percent in 2015, even as Chinese demand increased 16.7 percent, or 1.6 million barrels per day, from 9.6 million in 2012 to 11.2 million in 2015. Moreover, the competition for Chinese market share promises to intensify with the lifting of UN sanctions on Iran, which occupied second place in Chinese imports pre-UN sanctions and has expressed determination to regain its prior position (Iran’s exports to China fell 2.1 percent to 24.36 million tons in the first eleven months of 2015). Moreover, several Saudi competitors enjoy substantial competitive advantages. Russia has two. One is the East Siberia Pacific Ocean pipeline (ESPO) which directly connects Russia to China—important because the Chinese are said to fear the U.S. Navy’s ability to interdict ocean supplies routes. Its capacity currently is 15 million metric tons per year (~300,000 barrels per day) and capacity is expected to double by 2017, when a twin comes on stream. The second is the agreement Rosneft, Russia’s dominant producer, has with China National Petroleum Corporation to ship ~400 million metric tons of crude over twenty-five years, and for which China has already made prepayments. Russia shares a third with other suppliers. Saudis contracts contain destination restrictions and other provisions that constrain their customers’ ability to market the crude, whereas those of some other suppliers do not. Marketing flexibility will be particularly attractive to the smaller Chinese refineries, which Chinese government has authorized to import 1 million-plus barrels per day. While they fight for market share in China, the Saudis also have to fight for market share in the established, slow-growing or stagnant IEA-member markets (generally OECD member countries). Saudi exports to these markets declined 310,000 barrels per day between 2012 and 2014, and 490,000 barrels per day between 2012 and 2015’s first three quarters. Only in Asia Oceania did Saudi export volumes through 2015’s first three quarters manage to equal 2012’s export volumes. During the same period, Iraq managed to increase its exports to Europe 340,000 barrels per day (data from IEA monthly Oil Market Report). It is therefore not surprising that the Saudis moved aggressively in Europe in 4Q 2015—successfully courting traditional Russian customers in Northern Europe and Eastern Europe and drawing complaints from Rosneft. As with China, the competition will intensify with Iran’s liberation from UN sanctions. For example, Iran has promised to regain its pre-UN sanctions European market share—which implies an increase in exports into the stagnant European market of 970,000 barrels per day (2011’s 1.33 million barrels per day minus 2015’s 360,000 barrels per day). Might the U.S. be an Ally? Without unlimited crude export resources, the Saudis have had to choose in which global markets to conduct their market share war, and therefore, implicitly, against which competitors to direct their crude exports. Why did the Saudis ignore the U.S. market? First, U.S. crude does not represent a threat to the Saudis’ other crude export markets. Until late 2015, when the U.S. Congress passed, and President Obama signed, legislation lifting the prohibition, U.S. producers, with limited exceptions, could not export crude. Even with the prohibition lifted, it is unlikely the U.S. will become a significant competitor, given that the U.S. is a net crude importer. Therefore, directing crude to the U.S. would not improve the Saudi competitive position elsewhere. Third, in the U.S. market, the Saudis face tough, well-managed domestic competitors, and a foreign competitor, Canada, that enjoys multiple advantages including proximity, pipeline transport, and trade agreements, the Saudis do not enjoy. Finally, the Saudis may be focused on gaining a sustainable long term advantage in a different market than the global crude export market—the higher value added and therefore more valuable petroleum product market. Saudi Aramco has set a target to double its global (domestic and international) refining capacity to 10 million barrels per day by 2025. Depressed revenues from crude will squeeze what governments have to spend on their oil industries and, presumably, they will have to prioritize maintaining crude output over investments in refining. In this Saudi effort, the U.S. could be an ally. The U.S. became a net petroleum product exporter in 2012 (minus numbers in the table below indicate net exports), and net exports grew steadily through 2015. Growth continued in January, with net product exports averaging 1.802 million barrels per day, and, in the week ending February 5, 2.046 million. U.S. exports will lessen the financial attractiveness of investment in domestic refining capacity, both for governments and for foreign investors in their countries’ oil industries (data from EIA). The view that the Saudi market share strategy is focused on crushing the U.S. shale industry has led market observers obsessively to await the EIA’s weekly Wednesday petroleum status report and Baker-Hugh’s weekly Friday U.S. rig count—and to react with dismay as U.S. rig count has dropped, but production remained resilient. In fact, they might be better served welcoming resilient U.S. production. It may be that the Saudis will not change course until Russian output declines, Iraq’s stagnates, Iran’s output growth is stunted—and that receding output from weaker countries within and outside OPEC would not be enough. If this is case, the Saudis will see resilient U.S. production as increasing pressure on their competitors and bringing forward the day when they can contemplate moderating their output. NOTE: Nothing in the foregoing analysis should be understood as denying that the U.S. oil industry has suffered intensely or asserting that this strategy, if it is Saudi strategy, will succeed. Great article - thanks for putting all of the data together. Lots of theories out there as to what Saudi Arabia's motivations are - but this seems pretty spot on to me. It makes me wonder how much spinning OilPrice readers could take: US and Canada growth is responsible for the whole oil overflow in the last 5-6 years - and Saudis are targeting Russia/China?! OMG. And the author is a career Russophobe - obviously it makes him very trustworthy on those issues. One thing that has to be considered is if the Saudi's cut production, what would have happened to US shale with a sustained $80-100 WTI price? Likely US oil production would be pushing 12M/day right now, and the export ban would have been taken down anyway because producers would complain they can't sell all their oil domestically. Shale would keep growing, and OPEC would be looked at again to cut to support prices. That is the long view the the Saudi's needed to stop from happening. It would have been a complete disaster for the Saudi's and the rest of OPEC even though most of the members are very short-sighted and undisciplined. Methinks the article overthinks the issue. Expensive oil brought about oversupply. Defending that expensive price by production cuts fails when there is even more supply available. Between shale, tar sands, and deepwater, there is plenty of (expensive) supply. The Saudi strategy is pure simplicity: let the market fix things. It is not important where the supply cuts come from. A more complex strategy would be doomed. The Saudis have helped the process by increasing their own output, but only moderately. It could be viewed as a show of strength. Of course shale production will increase when prices recover, but without the frenzy of 2012-2014. Back then, producers rushed for the cliff edge with eyes wide open, assuming that the Saudis would save them as they went over. Those who survive the fall won’t repeat the mistake. I think this blog and the market missed the mark here. The Saudi's saw the inevitability of Iran coming back into the market. The world and OPEC had expanded production to take the place of Iranian oil. With Iran likely to re-enter the market producers that had expanded to fill the void now needed to secure their markets or have some of their production being side-lined by Iran's re-entry to the market. The Saudi's particularly had two agendas. They dislike Iran and do not want it to get more $ to expand its Shiite expansionist plans against its Suni agenda and they had production capacity that would have to be shut in to make room for Iran. I like the writer's theory. It does make sense. The Saudi's don't seem that smart. Wouldn't the Saudi's have been better off if they didn't pump over OPEC's quota. Maybe cut their own Saudi supply a half or 1 million bpd to keep oil price around $75 to $85 so they'd be getting close to triple the price for their oil , and make a private deal to China to be their sole supplier for any future increase in China's oil demand? Saudi Arabia could give China $10-15 discount per barrel, while getting near $85 oil from the rest of the countries they're exporting to..I'm no expert, just a thought. I would like to add that as a benefit of cheaper prices, the Saudi strategy is also making alternative biofuels less desirable as well as EV's ( why pay the extra money for a Tesla EV ). Thereby, extending the time frame whereby oil as an energy source and fuel is feasible. KSA strategy is clearly aimed at Russia/Iran/Iraq, but they full-well realize that their masters in the US/Canada/UK/Norway may bite the dust first. But that's how war is, you can never be certain of the outcome. As "resilient" as US production has been, this has not stopped it from actually declining significantly, with further declines already baked in due to the sharp decline in investments. Moreover, US shale companies have been able to stay in business thanks to continued financial injections from investors and banks, they are very far from being able to self-finance. This has also creates a brand new "subprime" ticking bomb on the balance sheets of western banks, hence the recent panic surrounding banks in Europe and the US. While Russia may be starved from financing due to sanctions and low oil prices, the fundamental fact remains: Russia/Iran/Iraq are low cost producers. US/Canada/UK/Norway and wherever western oil majors are active, are all high-cost producers. In the oil business, geology always wins in the end. Whatever their reasons are, they haven't achieved them yet. Interesting article. Nevertheless, the author would have more credibility if he would have his maths correct... e.g Canada growth from 4.28 to 4.37 is not 0.9... and some other calculation mistakes! I think your second table has an error... Canada's production increased 0.09 not 0.9. Other than that, great thanks for putting that info together! The problem is not an oversupply in the US. The problem is that we are still importing oil in the first place. If the idiot Saudis have no place to sell their oil they will become irrelevant. Stop importing oil we don't need their oil. I applaud the Saudis for doing their part to defeat ISIS. Pump on! The Saudi's started this war by wanting to shut down Shale production in the US. But, they didn't factor in 1) The speed at which the US could taper back production AND the speed at which the US can now ramp up production; 2) The falloff of China and their reduction in oil consumption; 3) The ripple effect of the China falloff across the globe. Now, everyone is just trying to raise cash, the Saudi's included. They can't cut production because they need the cash. But, the demand isn't there either. I think that we are where we should have been for the last 10 years from a commodity price perspective, and the bubble has just burst...That simple. Many of u forget that Iran is going to jump into the market with its huge oil production( thanks for Obama stupid foreign policy ) . KSA doesn't want Iran or Russia to binifit so much from that. They are both in war over Syria and Yemen. . KSA also had no other good option, the other option was to leave the market.